This unique performance offers a magical window on to a world of reincarnation and Buddhist mysticism which has inspired audiences in theatres and festivals throughout Europe. 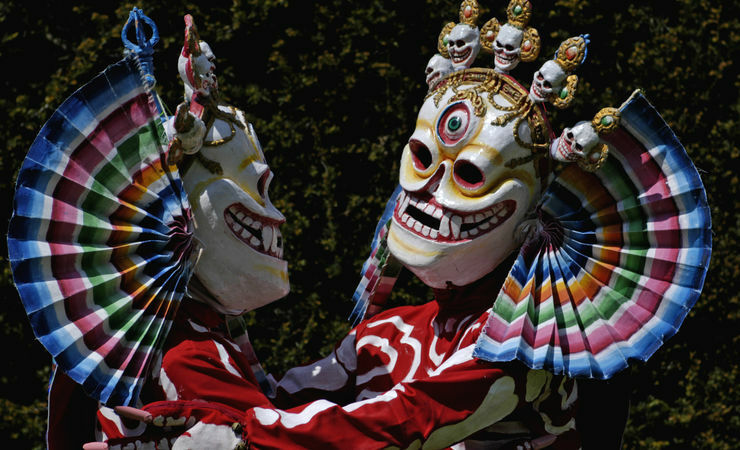 From the contemplative, mesmerising chant of Buddhist texts to swirling costumed masked dances accompanied by ancient Tantric musical instruments including horns made from human leg bones, skull-drums, cymbals, bells and with the shattering sound of the dungchen (long horns), the Monks evoke the atmosphere of sacred Tibet. Expect an experience of an ancient culture accessible to all, with introductory explanations offering additional insight into this endangered world. Founded by the first Dalai Lama in 1470, Tashi Lhunpo is one of the most important monasteries in the Tibetan Buddhist tradition. Re-established in exile in South India, it is one of the major centres of Buddhist learning, best known for its unique tradition of masked dances and sacred music. * Please note that this is an outdoor performance. Gardens are open from 6:15pm for picnics. Bring a chair or rug and a torch. "a psychedelic whirl of chanting, dancing, drums, cymbals..."